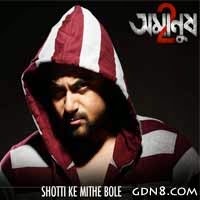 Shotti Ke Mitthe Bole Song Lyrics From Bengali Movie Amanush 2. This Rocking Rap Song Sung By EPR Iyer. Music Composed By Arindom. Starring By Soham Chakraborty, Payel Sarkar, Anindya Chatterjee, Rajesh Sharma And Others.